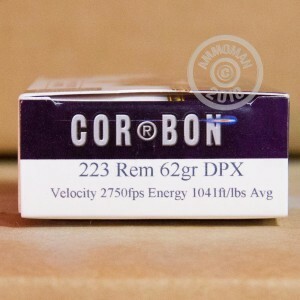 Corbon DPX ammo is a powerful multipurpose load for your AR-15 or other .223 Remington rifle. This is no range fodder--these premium rounds are intended to bring down coyotes and other varmints as well as human assailants if the need arises. They are optimized for strong penetration (about 12-17 inches) and can defeat various light barriers such as sheet metal or auto glass. 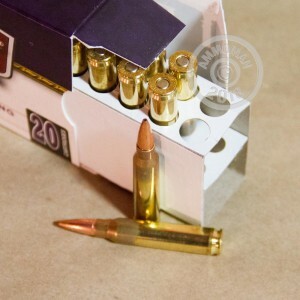 This ammunition comes in boxes of 20 and fires a heavy 62 grain solid copper hollow point bullet. Using a 16 inch carbine length barrel popular among both civilians and law enforcement officers, Corbon recorded a muzzle velocity of 2,750 feet per second--roughly on par with M855 ball ammo. Use a longer barrel for better extended range performance! Remember to take advantage of AmmoMan.com's shipping promotion as you browse our selection. Our free shipping for all orders over $99 is a favorite among high-volume shooters as well as those who like to use premium ammo!